If you faced the problem of a growing puppy don't lose heart as we know how to help you. The most widespread problem is that puppies grow up really quickly and the Prong Collar you have becomes small already in several months. You don't have to buy new collar any more to make it snug for your dog! 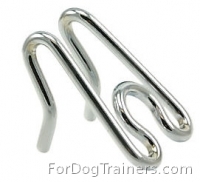 We offer you extra links fitting for HS Chrome Plated Prong Collar for 3.25 mm (1/8 inch) prongs diameter. By adding the links you can get the proper collar's size for your dog. It doesn't require any additional tools or skills so you can easily add a link to your dog's Prong Collar with your hands. One link will add 1 2/5 inch (3.5 cm) to the total length of the collar. What's so good about these links? All extra links as well as the collar itself are made by means of technique called Chrome plating. In this technology HS uses electricity that makes chromium solution to stick evenly to the surface. When it is done Herm Sprenger company use mirror-bright polishing to make their production shiny with smooth surface. These two technologies combined together make the collar and the links very strong, corrosion resistant and prolong their lifespan.